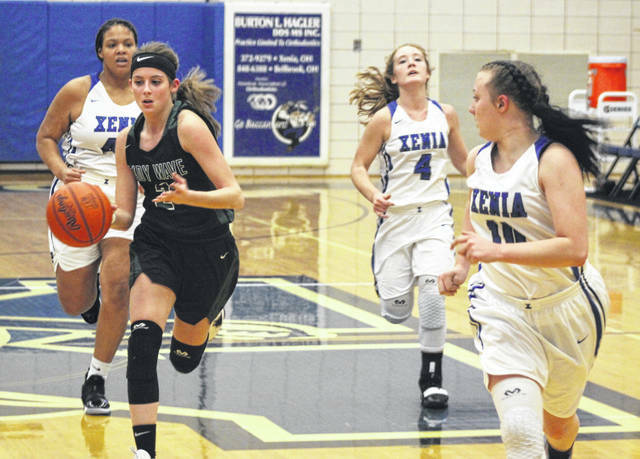 Greenville’s Haleigh Mayo-Behnken brings the ball up court with three Xenia players giving chase in a Greater Western Ohio Conference battle on Wednesday night. The Lady Wave won the game, 54-29. Greenville’s Nyesha Wright takes a shot over a Xenia defender in a Greater Western Ohio Conference battle on Wednesday night. The Lady Wave won the game, 54-29. Greenville’s Jada Garland surveys the defense as she looks for an open teammate in a Greater Western Ohio Conference battle at Xenia on Wednesday night. The Lady Wave won the game, 54-29. Greenville’s Morgan Gilbert drives to the hoop in a Greater Western Ohio Conference battle at Xenia on Wednesday night. The Lady Wave won the game, 54-29. Greenville’s Taylor Yates takes a bounce pass as she drives toward the basket in a Greater Western Ohio Conference battle at Xenia on Wednesday night. The Lady Wave won the game, 54-29. 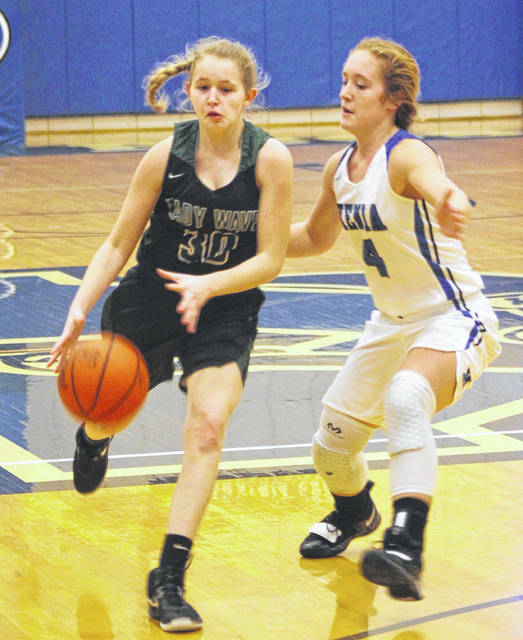 Greenville’s Annie Hayes looks for someone to pass to after picking up a loose ball in a Greater Western Ohio Conference battle at Xenia on Wednesday night. 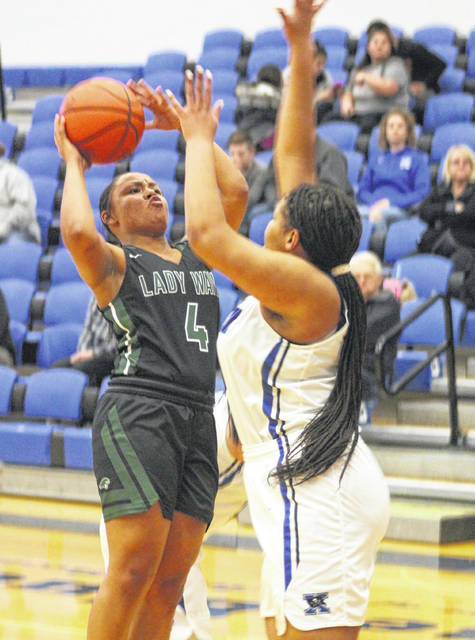 The Lady Wave won the game, 54-29. 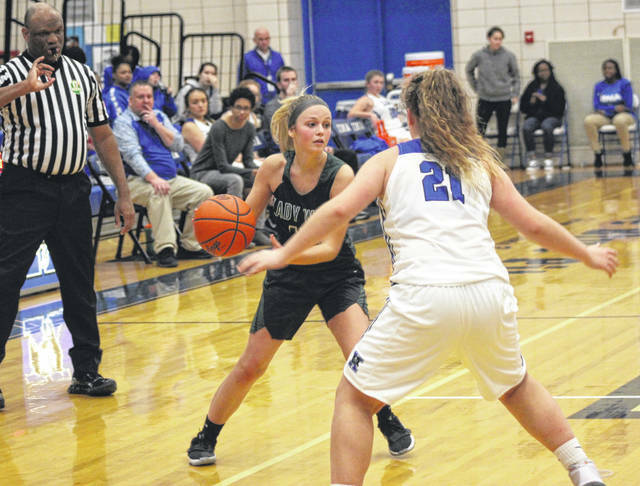 Greenville’s Jada Garland looks for a way to get around Xenia defender Brynna Mardis in a Greater Western Ohio Conference battle at Xenia on Wednesday night. The Lady Wave won the game, 54-29. 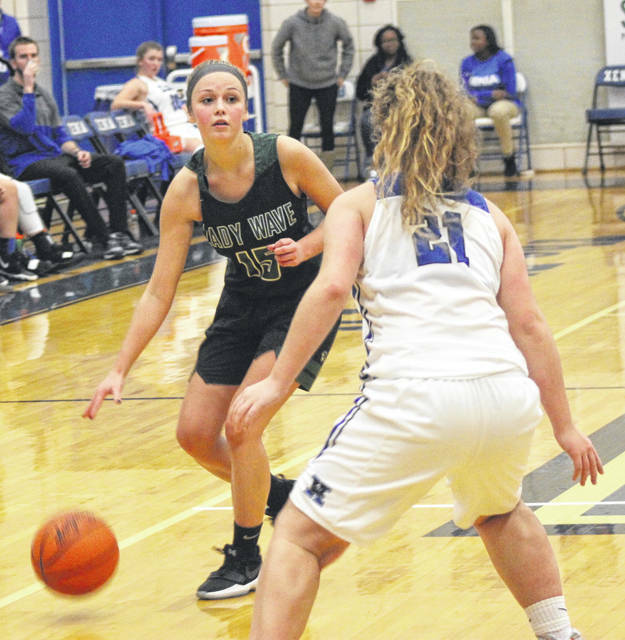 Greenville’s Morgan Gilbert surveys the defense as she brings the ball up to midcourt in a Greater Western Ohio Conference battle at Xenia on Wednesday night. The Lady Wave won the game, 54-29. 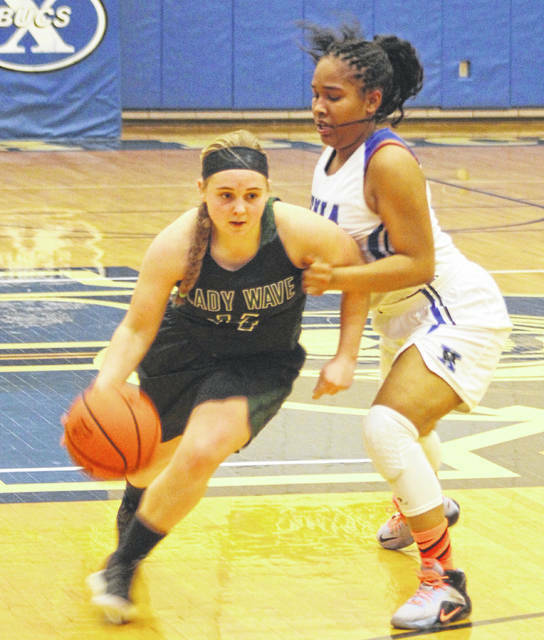 XENIA – After losing two of its last three games, the Greenville Lady Wave got back on the winning track Wednesday night with a 54-29 road win at Xenia. 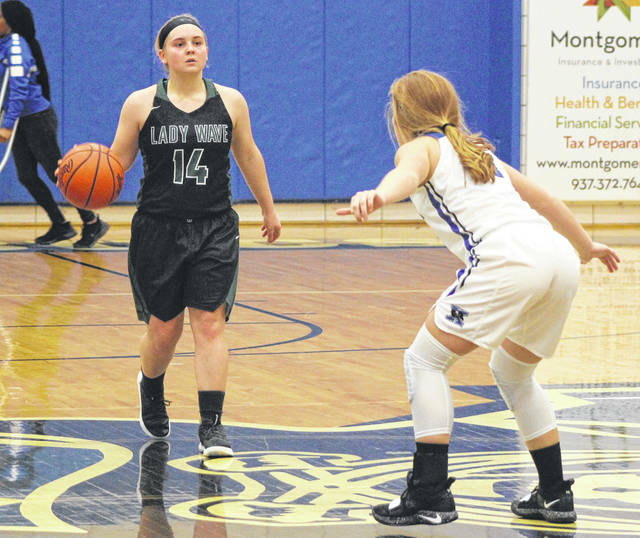 It was a dominating performance that saw the Lady Wave surge to a 34-13 halftime lead and they never looked back. Haleigh Mayo-Behnken had 12 of her team-high 18 points in the first half, while Jada Garland connected on a pair of 3-pointers for all of her 6 points and junior Morgan Gilbert got the hot hand with 8 of her 13 points in the first half including two triples in the second quarter. 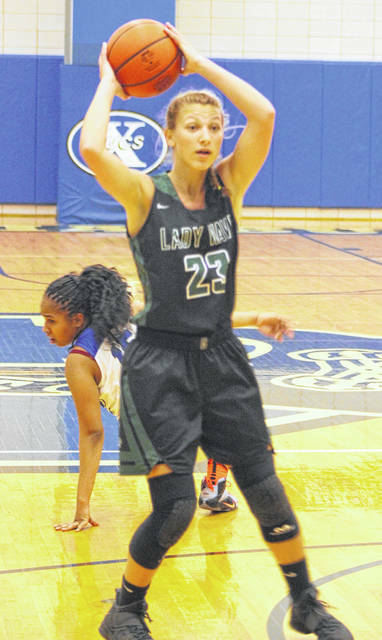 The Lady Wave defense forced 22 Buccaneer turnovers, according to Kerns. It was also the third game back for Gilbert. She has 2 points in her first game against West Carrollton and did not score on Monday against Milton-Union. Tonight, she hit double figures with 13 points. Xenia only had three players reach the scoring column and Kamea Baker accounted for almost all of it with a game-high 20 points for the Buccs. Olivia Wakefield had 7 points and Haley McManus got one basket. The Lady Buccaneers did get on a stretch in the third quarter where they got to the free throw line nine times including on a couple of technical fouls against Greenville, but they only connected on four of those extra shots and then the Lady Wave found their offensive groove again closing out the quarter with a 45-22 advantage. Greenville returns to action on Saturday with a 1:30 p.m. tipoff with Stivers at home. Greenville – Haleigh Mayo-Behnken 5 7 18, Nyesha Wright 0 3 3, Morgan Gilbert 4 2 13, Jada Garland 2 0 6, Koryann Elliott 2 4 8, Annie Hayes 1 4 6. Totals: 14 20 54. Xenia – Haley McManus 1 0 2, Kamea Baker 6 5 20, Olivia Wakefield 3 1 7. Totals: 10 6 29. 3-pointers – Greenville 6 (Gilbert 3, Garland 2, Mayo-Behnken 1), Xenia 3 (Baker 3). Records: Greenville (6-7, 4-5 GWOC), Xenia (1-13, 1-7 GWOC).